Emily Wilding Davison was the most famous suffragette to die in the battle for women’s rights, after colliding with the King’s horse at the Epsom Derby in 1913, but who was she, and how did she end up dying for her cause? Her notorious final act of protest has for decades obscured her extraordinary life. Now, one hundred years on from the first British women winning the vote, this new biography reveals the story of the respectable governess who pivoted towards vandalism and violence in pursuit of female enfranchisement. Times journalist Lucy Fisher draws on the suffragette’s own words, contemporary press reports and academic scholarship to paint a vivid picture of Davison’s unusual tale and tragic finale. In Lucy Fisher's compelling narrative Emily Wilding Davison finds her ideal biographer. Here is the story of a courageous woman, intelligent, dedicated, uncompromising, told in sympathetic detail – warts and all. As I read of Davison's seven hunger strikes and the forty-nine times she was force-fed, I admired her bravery and was awed by her sustained militancy. We owe her much and Lucy Fisher brings to her story a keen, appraising eye. Lucy Fisher's compelling account of Emily Wilding Davison's struggle is a must-read. Her biography paints a vivid picture of an extraordinarily committed and radical suffragette who dedicated her life to the women's movement. I can't recommend this book enough – and would urge anyone interested in the feminist struggle to read it. At last! A biography of the suffragette martyr who emerged from the crowd to try to grab the bridle of King George V's horse at the 1913 Derby, symbolically reaching for the reins of power. 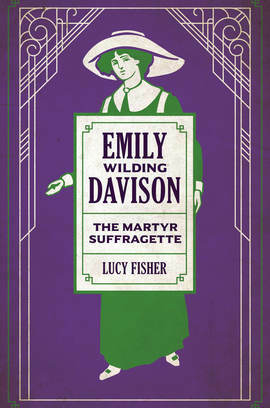 Lucy Fisher's definitive and dashing narrative honours Emily Wilding Davison, who died for Votes for Women. Compelling, enraging and inspiring. Lucy Fisher reveals Emily Wilding Davison to have been a passionate and difficult woman whom it is impossible not to admire. Emily Wilding Davison’s qualities – total dedication to a controversial cause, preparedness to endure suffering and vilification, super-activism, almost supernatural resilience – these are the very qualities that today’s generation of feminists need. This book sweeps you through her incredible life and leaves you certain that today she’d be at the forefront of modern women’s struggles: #MeToo, the pay gap and the battle against domestic violence. A book for boys and men, too, to learn that women changed the world. A compelling examination of the short but eventful life of the suffragette Emily Wilding Davison. […] This skilful biography unpacks the apparent contradictions in Davison’s life. Fisher does not shy away from describing the cruelty of the treatment that suffragettes received, but makes a convincing case for Davison having achieved a great deal more than simply being a martyr to the cause. Highly readable […] Sometimes it can be annoying when a book asks more questions than it answers, but in this case, the eternal mystery of Davison’s story continues to fascinate. Lucy Fisher is a fast rising star in the cut-throat world of political journalism, who takes up the post of defence editor on The Times this autumn. This elegant and well written biography will add lustre to a blossoming career and is an excellent portrait of an extraordinary life.